Ryan from Kaiju Hosting sent in an exclusive offer featuring high RAM and Bandwidth KVM virtual servers. They are a Registered Corporation in the State of Illinois. The hostnodes feature Dual Intel Xeon Quad Core CPUs with 48GB RAM and 4 x 2TB HDDs configured in RAID10. They are connected to a 1Gbps uplink. They offer PayPal, Credit/Debit Card, and Bitcoin as payment methods. As always, please ensure you read their terms, which are available here. Let us know what you think of the service if you signup by leaving feedback in the comments section. Looks good but no option for Bitcoin payments. This is Ryan from Kaiju Hosting. My apologies for the confusion, Bitcoin payments are temporarily disabled due to an issue with our payment processor. You can e-mail their support at support@kaiju.cc for assistance with bitcoin payments! We do not offer SolusVM at this time, all VPS services are unmanaged. However we are here to help if you have any issues with your VPS or would like to pick a different OS, or if you need root password reset etc. Just submit a support ticket and we can assist! An extra IP would be $3/mo for this package. Can FreeBSD 11.X be used, even if via custom ISO? Most certainly! We love custom solutions. You just need to allow us a short bit to install that manually if we do not have a template for it. I need full PPP and ip_gre suport in kernel for pptp client and server. I will give them a try for our office travel WiFI traffic. Do you think we can stop posting offers with X “vCPU Cores” and be a bit more specific? Yikes! Looks like packets from OVH Beauharnois are getting routed via London?! Thank you for bringing this to our attention! I’ve contacted our upstream carriers and we’ll work on getting this fixed. Ryan’s disappeared like every other fly by night scammer. Do you support BYOL windows? Please contact us at support@kaiju.cc to set up anything requiring a custom ISO. We’d be happy to assist. We do not currently offer DDoS Protection on our Budget VPS. OK, I’ve got my VPS up and running. Speed is great, and support is great too! Very happy. Hey guys. What is the exact CPU model I’d get on the Starter plan? I’ve ordered the Performance package! Waiting for it to be set up now. How can I get more cpu usage? I’d avoid these guys. 12 hours after payment, no contact, no server, no support. Not a good sign at all. I cancelled. Please double check your spam folder to ensure that your mailserver has not flagged it for any reason. I’ve resent your credentials to your e-mail on file. Please contact us via our support system if you’re still not receiving our e-mails. C’mon with the “please check your spam” when you know full well that you didn’t contact me until after you posted here. I waited over three hours from payment to start a ticket. I received auto-replies for that. No actual interaction for another 7 hours when you noticed I posted here. You guys dropped the ball. Own it. That wouldn’t be a big deal. Lying about it and offering a 50% refund for a year service that I cancelled hours before you even turned it on does not inspire confidence in the new guy on the block. Our website was temporarily offline while we performed maintenance. This did not impact our clients’ connectivity, only our billing platform. Avoid at all costs! After 8 hours of waiting for tech support with no server I gave up and requested cancellation. Another three hours later I received the first response. They refused my cancellation and started the server. They would offer me a 50% refund for a year service they started three hours after I cancelled. I had to dispute with my credit card. If you’re ok with no front-end, no support, and a creepy business model then by all means say yourselves $5 with these guys. Otherwise look elsewhere for a reliable service. From Kaiju Hosting, thank you to everybody for taking advantage of this deal. Exceeding our initial expectations, we’ve provisioned 8 new nodes to handle all the new signups. I’ve been a customer on kaiju for a while and i can say their services are quite good, especially the support. I’d definitely recommend even if it’s for the support alone. Ordered a server and can understand getting a ton of business and needing time to activate the servers. Biggest problem is there is absolutely no control over the server. No reboot, no password change, no OS reinstalls other than I believe KVM. It even took some time to find my login information since most who use the CP have the ’emails’ option where I can see all communications. Instead I found it in the ticketing system. The service itself seems decent enough at the moment but a reboot option is pretty critical and the same reason I dropped a dedicated server this week… as good as they are having to ticket a reboot or OS reinstall and having to wait hours for something to happen don’t really cut it when most others do. Still deciding if I will keep it past the renewal period even at $3. Thank you for your feedback. A custom panel is in the works, as our goal is to avoid cookie-cutter frameworks that can be launched on any network. Our goal is a custom panel without the use of WHM or SolusVM. However in the meantime our support team tries to be as responsive as possible for anything that you need. 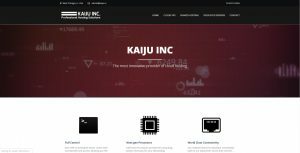 We are a small team and are working on big things for Kaiju Hosting’s future. I’m using their service for some weeks now, and i think it is quite good. Machines work like it should and the support is great and friendly. How long does it usually take to set the server up? Your credentials should have arrived via e-mail to access your VPS. If you haven’t received them yet, please send an e-mail to our support team at support@kaiju.cc for assistance. Hi! Interested in this offer, however, does IPv6 “on request” mean that IPv6 will cost extra? It does not cost extra. 1x IPv6 address is provided upon request. Took 1 second to send the bill but I’ve been already waiting a couple hours for any server information. Haven’t received any emails and the admin panel is completely empty. Ordered the first $6 VPS. Fast service. Ordered the second VPS (largest VPS) a week ago. Still no signs of getting one. Sent emails and questions through ticketing system with no answers. Thank you, Ryan. You are the best. Ryan reached out to me and solved my problem. They had a backorder of SSDs for their servers. I know the feeling, Pavel. Same situation. Paid for service 3 days ago. Created Ticket #2616 after 24 hours. It’s now been 48 hours and not a single peep from them. Based on other feedback here, I think I’m going straight to my credit card company to dispute this. They are probably a small operation. I get that. They don’t promise instant provisioning. So I’m not expecting even same-day provisioning. But no communications whatsoever? Does Kaiju understand that this is the exact same behavior we see from fraudsters? Take the money and shut up? Well, should have read comments twice before ordering. Not a single response after payment, support ticket is still open for a three days. Finally got my VPS provisioned, thanks to Ryan! Pros: it is fast, really; Cons: there is nothing for management, not even a reboot option or VNC, however I’ve been told that custom panel is on the way. I have to recommend against using this service for exactly the same reasons. No support. 72 hours and they have my money. I don’t have VPS. Nor even a single response from them. Email, ticket, nothing. Avoid. No VPS after 4 days, no response from support. I have to agree with all the latest comments…don’t do it. I am client for some months already, and in the beginning there were some issues with support, but this got solved reasonable fast, and the servers were performing well, so at the end no complain. Now for almost a week i can’t access one of the servers, so i raised a support ticket four days ago, and haven’t heard anything yet….?! Although their servers are working well, i think good support is also part of being a professional hoster, which Kaiju is clearly not. They also lack a control panel to manage the devices, so for everything you need to raise support tickets. @Pavel: funny that you mention the control panel, they told met that months ago already, asked me even if i wanted to test it, and see…months later still only promises. I have 2 vps with them which I’ve paid them on yearly term. I requested for the vps details but they are silent about it. Not any single response made for almost a week now. I personally think that there’s something fishy going on since they already got the money but leaving me with offline vps and unacceptable support (no responses been made)! AVOID…AVOID…AVOID…AVOID! Same too. No answer – but just payed. I think they are a bit criminal. It seems to work. I will test the server and write a detailled statement here. Works stable since 3 Months. I order vps and paid. After 3 days, I have not seen anything. support does not respond. It’s been 18 days since payment, and 15 days since creating a support ticket. I am still waiting for my VPS server to activate. Is this company even operational anymore? I’m guessing they’ve disappeared, my VPS was active for about 2 years and then suddenly gone. No response to support tickets, they used to be really good at responding, but I guess he took the money and ran. Damn scammers everywhere.